As we approach Equal Pay Day – April 10 – we want our day of events to make a dent in the problem. We are, after all, constantly using fitness as a catalyst to help you chase your big goals, and what bigger goal could there be than advocating for yourself and others? To do that, we created a full day with the expertise of AAUW and the partnership of our friends from Luna, Honest Tea, KitchFix, Paper Source, Six Degrees Society, sweetgreen, GlowOut, Notable Nails, PRE, Simple Mills and more. Where will we be for Equal Pay Day? We’ll be at the gorgeous new venue Loft Lucia at 7 N Carpenter St. This venue is great for all sorts of events – from female empowerment to weddings, whatever. Because we’ll be in the space all day, it will be open to you to co-work, with free-flowing Wi-Fi, snacks and drinks to keep you productive all day. What are we doing for Equal Pay Day? Here’s the day’s itinerary. Book as many events within the day as you’d like or just one. 7 am-8:30 am: Meditation + Bullet Journaling. We’ll start the day with an energizing meditation by Rogan Motis of Chill and then create bullet journals to set us on the path to achieve all of the big goals we can imagine. We’ll pursue this creative project with the help of our friends from Paper Source. The workshop fee includes a new moleskin notebook, supplies to turn plain notebooks into bullet journals, instruction and meditation. Breakfast will be provided by KitchFix. 8:30 am-12 pm: Complimentary co-working. Loft Lucia will be open as a part of Equal Pay Day for free co-working. 12-1 pm: Networking Lunch with Six Degrees Society. We’re partnering with our friends from Six Degrees Society for a networking lunch unlike anything we’ve experienced. You’ll be matched ahead of time with three to four people, curated by the experts at Six Degrees Society – you’ll become fast friends, maybe even helping each other with your next career move. Lunch will be provided by sweetgreen. 1-3 pm: Complimentary co-working. 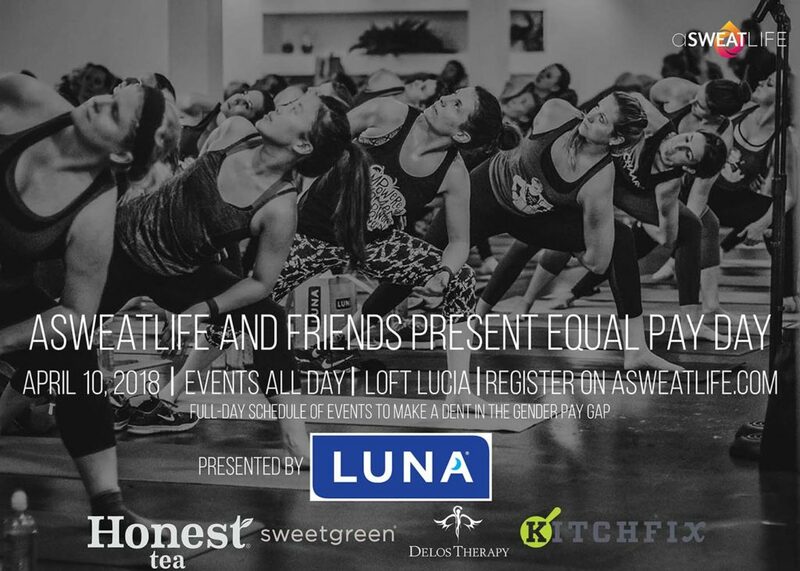 Loft Lucia will be open as a part of Equal Pay Day for free co-working. 3-5 pm: Complimentary Pay Negotiation Training by AAUW presented by Luna. This portion of the day will be completely complimentary. Grab your colleagues and take this time for your career. You’ll walk away from this two-hour workshop with negotiating skills that will help you outside of your salary conversations. This pay negotiation workshop will be facilitated by the AAUW and is presented by Luna. And to make getting to and from the training more accessible, Lyft created a special offer for us. With code AAUWCHI get $5 off two rides to or from Loft Lucia on the day of the event from 1 PM to 6 PM. 5-6 pm: Notable Nails will give complimentary manicures on a first-come, first serve basis. 6pm: Sweat X Sweat – Boxing meets Barre. If you’ve been asking yourself, “Where’s the workout?” – rest assured, there’s always a fitness element to help us achieve our big goals. We’re creating an IRL mash-up from the SweatWorking App and your next favorite combo class. This workout will bring together the tough boxing workouts that Courtney Belcastro delivers and the tiny, toning movements by Trista Greco that will make you weird-sore the next day – also known as barre. All workout attendees will automatically be granted access to the panel. 7:30 pm: Panel Discussion – Blazing a path to the top. To finish the night, we’re pinching ourself over the panel of incredible women who will speak about how a path was blazed for them and how they’re helping women today. We’ll be announcing the panelists on a rolling basis, but here’s who we’re ready to announce. Moderated by Alida Miranda-Wolff: Alida is an experienced venture capital pro, seasoned at Hyde Park Angels where she created pathways to success for entrepreneurs in a wide variety of sectors. She’s whip-smart, constantly learning and always ready to help someone who asks. Katlin Smith, CEO/founder of Simple Mills. This Chicago-based company is at the forefront of a clean food movement that is shaping the next generation of natural foods. Named to the Forbes 30 Under 30 Class of 2017, Smith launched Simple Mills in 2013 to provide a cleaner alternative to the natural baking mixes then on the market. Jenn Dieas, CEO/founder of GlowOut: GlowOut salons are chic boutiques where women get pretty and get social with friends. Glowout houses the essential quick beauty services; blowouts, airbrush tanning, natural nails, makeup and brows in spaces designed to host parties large and small. Jenn is a natural and empathetic leader who channels having to be the boss of her life early into being a boss now. Riana Lynn, Co-Founder of Women Tech Founders, Journey Foods, Director Cleveland Avenue Ventures: Riana is a leader in food innovation, technology, and venture strategy. A biologist turned serial entrepreneur, Riana has developed high-growth, nationally recognized technology, and food businesses. First-hand experience working through problems and scaling a family juice company inspired her to develop acquired supply chain transparency software. She now serves as the CEO of Journey Foods, an exciting combination of her science, CPG, and technology backgrounds. Riana’s work impacts some of the most innovative food and agriculture startups in the world, as well as Fortune 500 companies on new innovations. Her accomplishments have been featured on CNBC, Forbes, USA Today, Wired, TechCrunch, Entrepreneur Magazine, among others. Baaba Holland, founder and CEO of the Baaba Holland Agency: Baaba Holland is a Financial Executive turned Branding Boss. The Baaba Holland Agency grew out of Baaba’s lifelong passion for design, creativity and overall style. Guided by an innovative and direct approach, Baaba helps clients elevate their brands, achieve their goals and unlock their potential. Baaba is extremely passionate about the art of branding, the science of business development and the idea of disrupting the status quo. Driven by the desire to help her clients, and her own intellectual curiosity, she learns everything about her client’s challenges and goals before creating magic for their brands. Baaba loves working with extraordinary leaders to take their businesses to the next level. She believes that your only limit is your mind and that the cure for fear is knowledge & action. Before starting The Baaba Holland Agency, she was an executive at Fortune 500 companies like JP Morgan Chase and Wells Fargo, eventually moving into a Risk Management firm, offering solutions to Museums and Cultural Institutions. She received her bachelor’s degree in Marketing from Howard University and completed her MBA at Roosevelt University. Baaba is also a board member of Step Up (suwn.org), Chicago chapter. Learn more about the programming here.